A rugged, sanitary float valve which combines quick disassembly/assembl y with easy cleaning. Sanitary finish both inside and out allows the valve to be fully submerged. The balanced plug with O-ring seals provides positive sealing. It can withstand inlet pressures up to 60 psi. It handles 100 gallons per minute at 60 psi. Determine the desired liquid level. 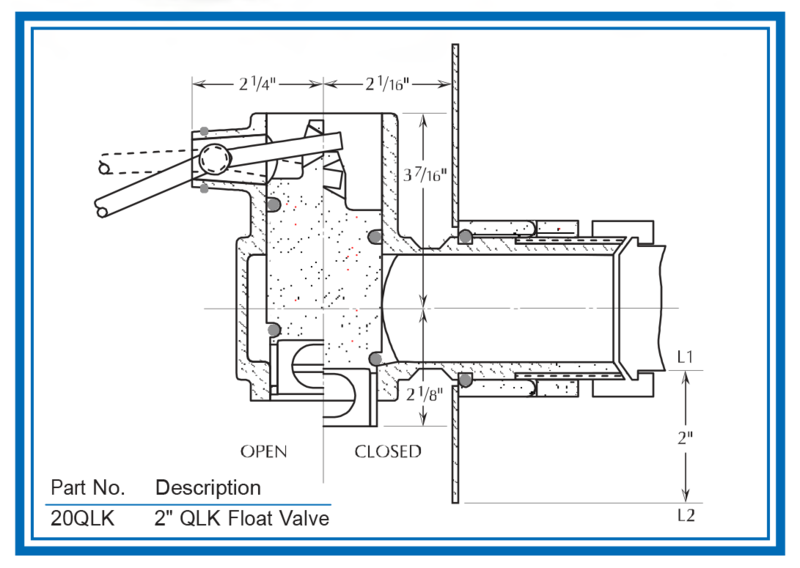 The valve height should be located so that the maximum liquid level is between (L1) and (L2), see sketch. Mark wall of tank and cut hole accordingly. Weld tank sleeve (8) to the outside of the tank wall. Remove burrs. Secure body to tank with lock nut (9). Insert float ball pivot (1) into valve body, locking with O-ring (2). Make sure that incoming feed line is properly supported and does not expose valve and tank wall to strain. Connect inlet line to valve. To minimize foaming, connect 21/2" Tygon tubing (customer provided) to the valve outlet, directing liquid to bottom of tank. Test valve in place to find liquid level necessary to open and close valve under normal operating conditions. Make final liquid level adjustments by bending float rod. Suggested O-ring supply for one year: 6 pieces of Item (2) and (7) and 12 pieces of Items (4) and (6) (see chart). Due to varying conditions in each system, Q-Control Valves should be installed and tested in-place before being relied upon for operation. The manufacturer’s warranty relates to workmanship, sanitary requirements, and action as tested when shipped. Any liability cannot exceed the price of the valve.